All necessary equipment (a display stand along with a computer), as well as printed materials and data in electronic form, were delivered to Shabanbai Bi the other day. The equipment was mounted in the library area on the second floor of the rural district’s administration building. The information centre aims at fulfilling 2 main functions: here will be concentrated all the information for both incoming foreign and Kazakhstani tourists (in printed and electronic forms), as well as all kinds of educational materials for the local residents who have already been working in the field of tourism or would like to do so in future. The Tourist Information Centre will open its doors at the beginning of the next season. In order to support its work we are looking to cooperate with the students of Karaganda universities, who could work there as volunteers. Shabanbai Bi village, Aktogai region. 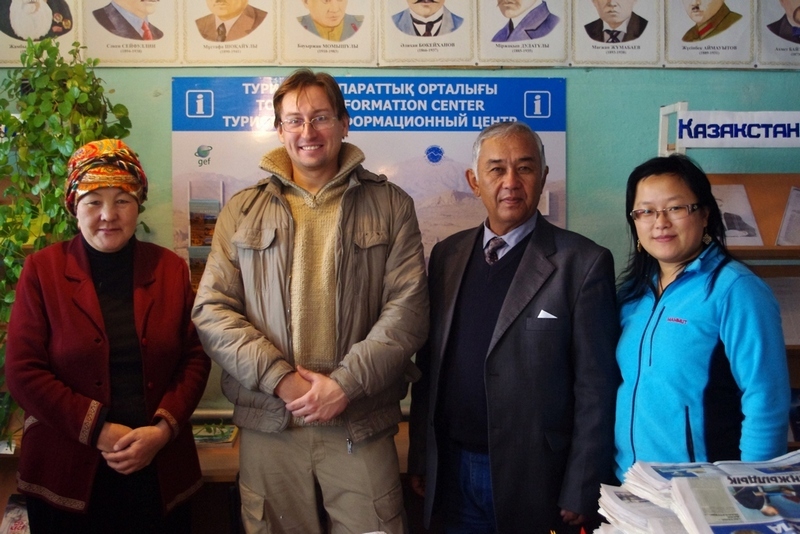 The Tourist Information Centre has been opened by "Avalon" PF in cooperation with Shabanbai Bi rural district authorities in the framework of the second phase of the project, funded by GEF/UNDP Small grants programme, "Ecotourism in Central Kazakhstan: conservation of the protected areas natural resources and creation of economic opportunities in the rural areas".